Dentist in Pittsburg, KS | "Ride Free and take Risks"
Posted September 14, 2010 . Now that you are up to speed, I want to share with you “the rest of the story”. Shortly before Father’s Day, I casually mentioned to a friend my desire to upgrade/up size my motorcycle. He mentioned that his dad was searching for a good bike to buy. He had one years ago and loved it. He missed riding and wanted to start again. Any rider knows that yearning to get back on the open road with the sun in your face and the wind in your hair. (Unless you wear a helmet like me–then again, even with no helmet, I have little hair for the wind to bother. But, I digress.) When asked, he said his dad’s bike was a Honda. I mentioned my Honda may become available someday. We than parted ways. Imagine my surprise when the dad called me a few days later and scheduled a time to test ride. He loved my bike. Why wouldn’t he? It was an awesome bike. He made me an offer. Cash changed hands and so did the title. At that moment, I had become an ex-biker. I spent the entire rest of the summer looking at the classifieds, on craigslist and eBay. As the summer progressed, the available bikes became more scarce. I increased my distance and found a few a prospects in Florida and Arizona. I was tempted, but that was too far for an in-person inspection. Just as I was about to consign myself to waiting until late fall, I saw her!! What a beauty she was. And to make matters even better, she was currently residing in Lawrence, Kansas. I took the relatively short (2 1/2 hour drive) to get acquainted with her. She appealed to me right away!! I considered my options and decided to make a deal. I am excited to report that I am no longer an ex- biker. 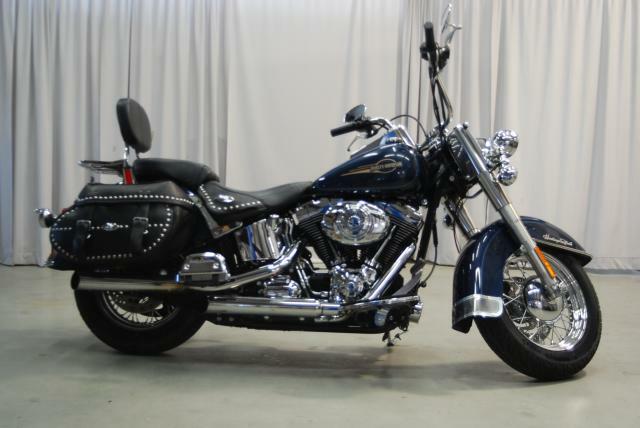 I am proud to state that I am the owner of a 2008 Harley-Davidson Heritage Classic!! She needs a few upgrades–tires and and a new windshield–but in a very short time I anticipate getting her out on the open road to enjoy hours of sheer pleasure. And just in time for a beautiful Autumn riding season. My patience paid off. Harley dude, now that has a great sound to it. If you ride too, maybe we will have the opportunity to share the road and a few stories too. My friend, Randy, sent me the quote that is the title of this entry, and I plan to take it to heart. “Ride Free and take Risks”. May we all so blessed!